Presented by PLAN Jeffco, In Plein Sight features 25 professional artists painting from dawn to dusk at one Jeffco Open Space location each day September 10 – 15, 2018 with a gallery exhibit running September 12 – 16, 2018 at the Golden Community Center, 1470 10th Street, Golden, CO. This free, week-long public exhibition is open for all ages to enjoy and will feature freshly painted works added to the gallery daily as the artists continue to produce new pieces throughout the week. All artwork will be available for purchase, with a portion of the proceeds benefitting PLAN Jeffco’s educational outreach. Gallery hours are 3 – 6 p.m. Wed. – Fri.; 10 a.m. – 8 p.m. Sat. ; and, 10 a.m. – 4 p.m. Sun. PLAN Jeffco is a nonprofit volunteer-led organization of open space advocates based in Jefferson County, CO that works to preserve open space with a goal to provide citizens with an enhanced quality of life. For more information, visit www.planjeffco.org. 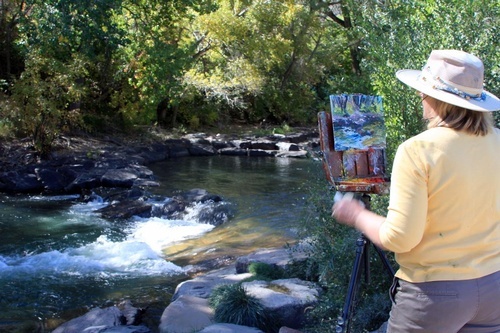 Sept. 10 - 15, painting at various Jeffco Open Space locations (see planjeffco.org for details); Gallery Exhibition at Golden Community Center Wed., Sept 12 - Fri., Sept. 14 3 – 6 p.m.; Sat., Sept. 15 10 a.m. – 8 p.m.; and Sun., Sept. 16 10 a.m. – 4 p.m.